If you hike along the Pine Mountain Trail and see broken old blown down trees in the area of Mile 12-13, near Mile 14, near Mile 15, along the Beaver Pond Trail just north and south of Ga 190 and near Dry Fall on PMT near trail Mile 22.2….and wonder what this is about, well this was from a tornado. 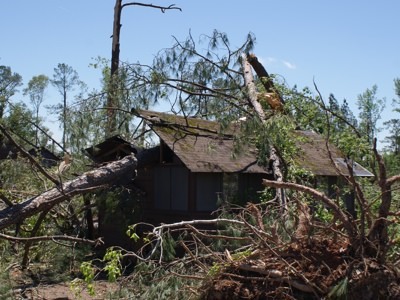 The Pine Mountain Trail and FDR State Park was hit in 8 places Wednesday April 27, 2011 around midnight by a very powerful F-2 tornado that in places the path was about ½ mile wide. FDR State Park had also rented out a "Large Group Camp" area (dining hall and 40 primitive cabins). That area was literally 70% destroyed building-wise and 99% tree-wise. This is the area we had had our Pine Mountain Trail Association Pig Out dinners at for over 30 years. This area was cleared of salvageable timber and restoration was done on some cabins and the dining hall. The Large Group Camp will not reopen for groups per say due to lack of tree cover amongst remaining building areas. 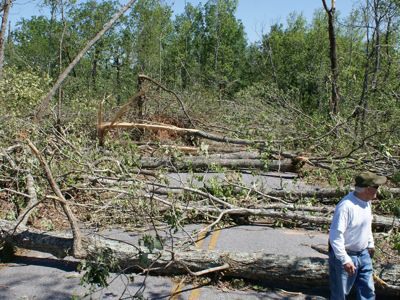 We could not have cleared all the initial damage if not for so many volunteers helping beginning that first weekend in May 2011. If you helped, we appreciate you and will never forget all the labor it took to open those damaged sections . As always, if you hike not on a workday and find a blow down or area that needs work please let Carl or Jim Hall know specifically where it is so we send a crew in to work on that spot. Photos are great and GPS locations too. What is back open? The entire main Pine Mountain Trail was opened back up on July 30, 2011. Bethel Creek Campsite was wiped out and closed from April 28, 2011 till March 9, 2012. It was opened back up thanks to an Eagle Scout candidate clearing it as a project in January of 2012, but weeds took it over again summer of 2012. It was cleared again in May of 2013 and weeds again took over. So the decision was made to close Bethel Creek Campsite at the old location and relocate it east. See site descriptions for details of the new location east of Mile 13. PineMountainTrail.org is a site dedicated to the construction, support, maintenance and enjoyment of the Pine Mountain Trail. The Pine Mountain Trail is located in Meriwether and Harris Counties in west central Georgia. ©2016 Pine Mountain Trail Association, P.O. Box 5, Columbus GA 31902. E-mail us with questions or comments.